The Agilent 2100 Bioanalyzer G2939A is a microfluidics-based platform for sizing, quantification and quality control of DNA, RNA, proteins and cells on a single platform. Results from thebioanalyzer system are delivered within 30-40 minutes in automated, high quality digital data. The Agilent 2100 Bioanalyzer is the industry standard for proteins, cells, DNA, and RNA sample QC and has replaced labor-intensive gel electrophoresis for this application. The Electrophoresis Cartridge allows for precise investigation of nucleic acid samples and various types of samples can be analyzed such as total RNA, large and small DNA fragments, Micro RNA and labeled RNA. The Agilent 2100 Bioanalyzer has become a standard in many labs for genomic functions such as DNA quality control and RNA quality control. This compact 2100 bioanalyzer model G2939A has been a staple for a very long time, thanks to the highly accurate and easy to use lab on a chip concept that was introduced with the bioanalyzer 2100, and uses minimal sample 1-4uL, simply load the chip and press start. 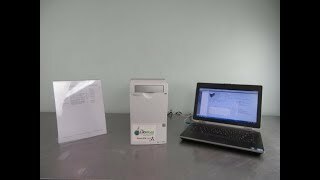 This automated bioanalyzer uses electrophoresis to provide data on sizing, quantitation, purity, assesment, while the pre packed reagent kits and assays mean contamination free switching. The Lab on chip technology, prepackated kits and compact nature make this agilent bioanalyzer an efficient and powerful tool to add into your research, without sacrificing a lot of precious samples. The Agilent 2100 Bioanalyzer G2939A is simple to set up and simple to operate. It is also rapidly replacing gel electrophoresis for DNA fragment analysis and SDS-PAGE analysis of protein samples. The Lab on Chip design delivers high quality electropherograms through Expert software provided with the Agilent Bioanalyzer. This RNA analyzer system is capable of using Agilent's high sensitivity chips and comes with an Electrophoresis cartridge installed. You can purchase consumables directly through Agilent's website. You can now use your smartphone as a barcorde scanner to increase efficiency with Agilent's Bioanalyzer Buddy App. The Agilent 2100 Bioanalyzer has been mentioned in over 11,000 papers as of 2011 and is recognized in many as a way to judge and set standards on those tests. Included with the bioanalyzer from Agilent is the simple and straightforward, yet robust, Expert software. The newest software service packs are available free from Agilent at any time. The Agilent 2100 Software Expert service packs introduce new assays and sometimes enable new Agilent chips such as high sensitivity Bioanalyzer DNA chips. If you have questions regarding your desired applications compatibility with the model you would like to purchase or the Agilent 2100 software version, please feel free to ask and we will be glad to help. Please note we also have a priming station available for separate purchase. This Agilent 2100 Bioanalyzer G2939A has been fully tested with test chips, and performed to factory specifications. All of our lab equipment comes backed with our standard warranty. Should you have any questions about this or any of our other Analyzers, please don't hesitate to contact us.